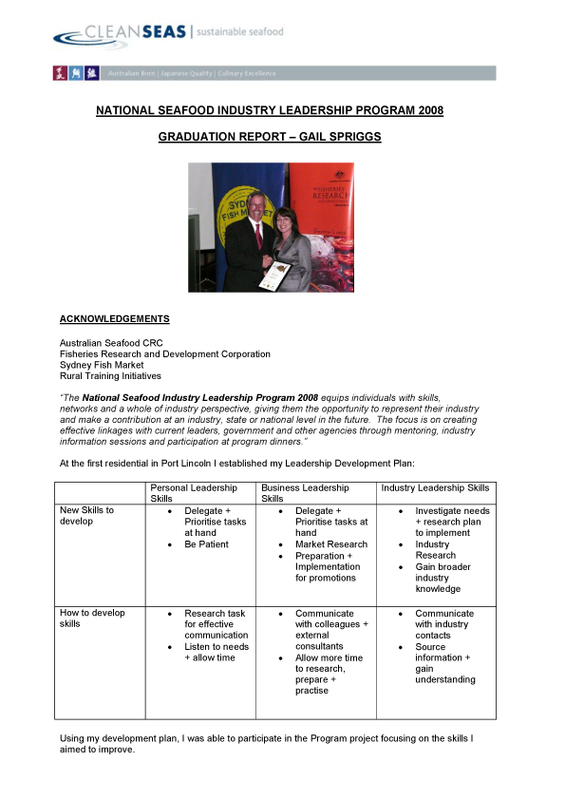 The National Seafood Industry Leadership Program (NSILP) equips individuals with skills; networks and; a whole of industry perspective, giving them the opportunity to represent their industry make a contribution at a national level in the future. The program comprises three residential sessions over six months with participants making a commitment to undertake a significant industry project during that time. The NSILP design focuses on creating effective linkages between current leaders and participants through mentoring, industry information sessions and participation at program dinners. Fisheries Research and Development Corporation has formed a partnership with Rural Training Initiatives to design and deliver the NSILP. In 2008, three Australian Seafood CRC participants were involved in the NSILP: Che Spruyt (SA Abalone Divers), Gail Spriggs (Clean Seas Tuna) and Raymond Pratt (Sydney Fish Market).